We are recently returned from a wonderful fall trip that took us to several National Parks in Utah, California and Colorado. 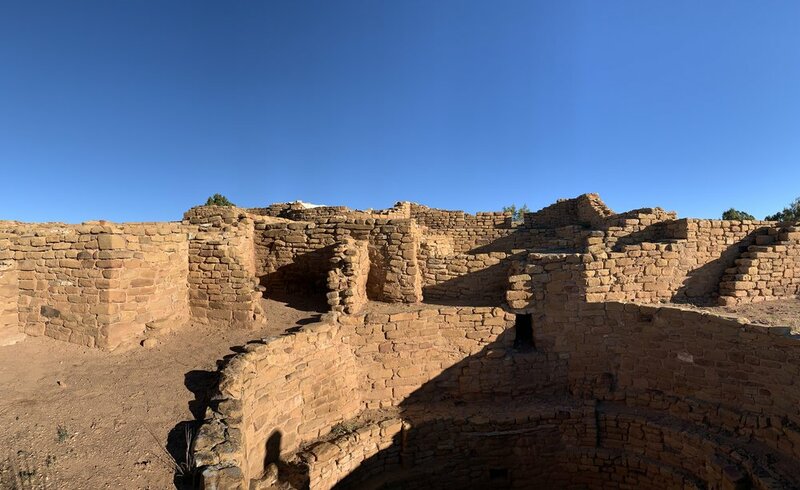 A highlight of the trip was a long anticipated visit to Southern Colorado to see Mesa Verde National Park, a site showcasing not only the breathtaking geology of the Colorado Plateau, but the incredible preserved architecture of the Ancestral Puebloans, descendants of whom today still live throughout the Southwest and are represented by Hopi, Zuni, Acoma and others. Anyone who has been to archaeological sites in the Four Corners region know how breathtaking and humbling it can be to see so much evidence of advanced culture spread out before them. It was my first time, and I came as a visitor with a strong interest in building and architecture and with no especial background in archaeology (except for a well developed sense of curiosity and wonder). I spent quite a bit of time at the sites imagining (and marveling over) the construction and development of the clearly advanced building skills that housed people in a generally harsh climate. I noted changes in technology that allowed for more functional heating (the introduction of a draft chamber to help the fires heat more effectively, for example), for the construction of watering systems (reservoirs and catchment systems) that allowing more controlled agriculture. Even the incorporation of window and door headers allowing for stacked construction could be seen very clearly, as though on a timeline of progress writ large. Seeing architecture go from the invisible history of nomadic life to tangible archaeological history represented by stone ruins proving settled life was simply incredible. Mesa Verde is probably best known for the many examples of cliff dwellings that are well preserved there. The buildings are in difficult to reach areas and thanks to that, at least in part, were well preserved over the years as they escaped the eyes of would be vandals and do not appear to have been consistently re-inhabited after the last of the Ancestral Puebloans left (for reasons still not fully understood but at least partly relating to population and climatic changes). The cliff dwellings are absolutely breathtaking to behold (bring binoculars, they will afford you wonderful viewing whether or not you are able to get in on the Ranger led tours which fill quickly and are only available seasonally). There are numerous other examples of earlier architecture in the area, ranging from pit houses to partially above ground dwellings as well as evidence of advanced water collection systems and a well developed society with religious and community dwellings (again, some of the significance and meaning behind these structures remains obscure) evident in abundance. How exciting it was to walk in the early morning quiet among all of this. We traveled during the off season and the cold clear mornings were wonderful for exploring without the push and shove of crowds. A walk through the Far View Sites and other points of interest (the self guided Petroglyph Point interpretive trail is my highest recommendation!) exemplified to us all sorts of architecture from various eras of habitation. Everything from pit houses to multi-storey square towers built into cliff walls with hand and footholds carved in to the rock for access and egress could be witnessed first hand in a relatively small park area. Not only this, guided walking and driving tours made it possible to learn a bit about all the subtle changes in architecture that came in between “covered pits” and three storey buildings with kitchens, storage areas and areas perhaps exclusively meant for communal gatherings. What all of this evidence pointed to, from a building perspective alone, was the required sensitivity to locally available materials (limited use of wood, lots of stone) and awareness of seasonal changes (south facing structures to pick up heat and light as well as borrow heat from cliffside and earthen thermal mass, cliff overhangs also provided shelter from rainfall). Elevation, even, was obviously and not so obviously taken into consideration. High, hard to access dwellings surely provided safety, but much of the Ancestral Puebloans food was grown directly overhead the cliff dwellings, where rain was more plentiful and temperatures more favorable to dryland agriculture. No grocery stores for a quick fill in, and crop failures would have been catastrophic rather than something to perhaps make our favorite foods more pricey than we’d like. Truly, Mesa Verde National Park is a fascinating, humbling and gratitude inducing place to visit! It seems to me that the lesson I most took away from the visit, in terms of architecture (as opposed to archaeology or cultural history, about which I know just the interesting bits I learned at the park) is that all of us humans build what we need with what we have, at least to start. As those two basic ingredients are met, we add new things…perhaps we add in safety (sounds better than defense), proximity to other members of our family, group, clan, tribe etc. Then might come things that reflect our commitment to things beyond the basics…pursuit of artistic crafts, development of technology, and spirituality become evidenced in the record. First, basic needs are met and then the layering begins as we augment and make our housing more homelike. We do have the option to go bananas (and some might say that we have, with our in house movie theaters, climbing walls, etc.) but it may not be our best choice of material usage. It’s interesting to note, as well, as you almost instantly will if you visit any site that has clearly been abandoned and not taken over by new folks, that our housing depends on our landscape from start to finish, once to get us off the ground by providing raw material for construction and throughout the life process to keep us in food, beauty, accessibility, and other provisions. It’s not clear what combination of factors forced the abandonment of Mesa Verde by the Ancestral Puebloans, but in our current era of changing climate and the things that may or may not come along with that in terms of agricultural viability, water availability and the safety that comes from just implicitly understanding what to expect in terms of weather, it’s an interesting point of comparison. What would cause you to leave your home? I gave this a lot of thought at Mesa Verde looking at the beautiful and durable architecture that wasn’t enough to stave off abandonment when more pressing issues came a knocking…I have given this further thought reading of the horrible wildfires that have caused such displacement and destruction in California, especially the most recent Camp Fire still claiming lives and livelihoods in Northern California. In seeing archaeology in person, evidence of our long history on this planet, I found it humbling to be reminded that change can occur (suddenly or otherwise) and our well laid plans, despite forethought, artistry and consummate skill, cannot protect us from every event. It made me wonder what steps I could take to keep sustainability in mind during all of our building processes. I know I can’t foresee every event, but surely the lessons left by ancestral humans from every background have teaching power still. It’s good and proper to be inspired!